Remember the days of school supply shopping, picking out the perfect first day outfit and reuniting with all your friends? Well, September is right around the corner and kids are heading back to school! 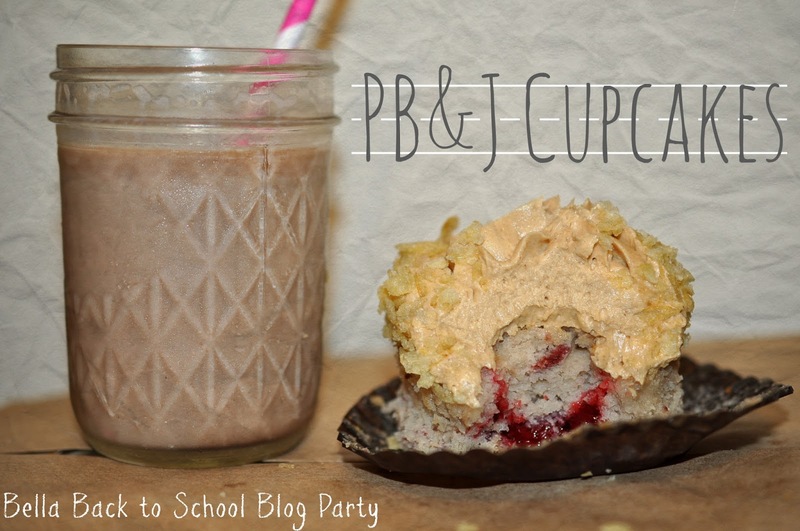 Though I'm past my first days of school these Peanut Butter and Jelly Cupcakes are perfect for the students in your life! For this Bella Cupcake Couture Blog Party the theme was "Back to School". We were sent white cupcake wrappers this time for our little ones to show off their inner artists! I had my little brothers design their own wrappers and even asked them for some inspiration on the cupcake recipe this time around. 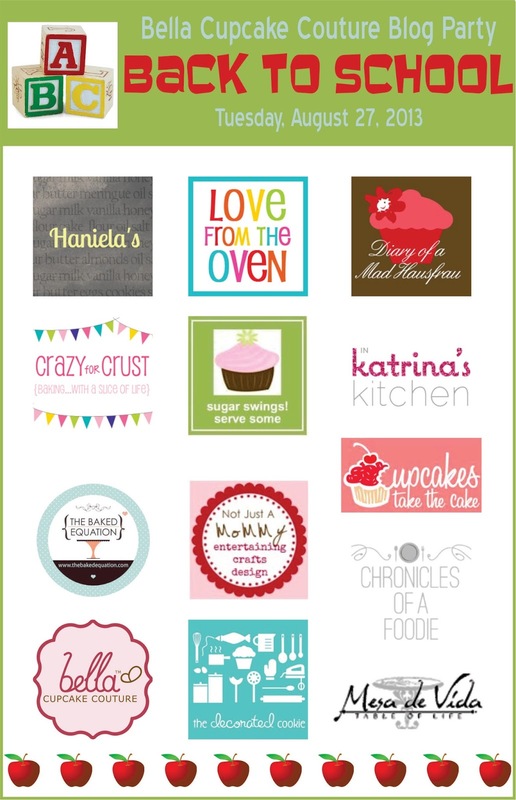 Make sure to check out the links below for the rest of the Back to School themed cupcake recipes from our fellow party bloggers! My youngest brother is 9 and everyday for lunch he has a peanut butter sandwich. I'm not joking. EVERY. DAY. He never gets sick of 'em! His peanut butter sandwich addiction reminded me of all the PB&J's I ate as a kid and voila! I semi adapted this from the Peanut Butter Jelly Potato Chip Thumbprint Cookies I made before but served up with a chilly glass of chocolate milk, this cupcake takes you back to your own childhood days. Like the last couple of Cupcake Couture Blog Party themed recipes these cupcakes were made from cake mix to makes things a little easier...let's say, semi-homemade...hey, it works for Sandra Lee! I spruced up this cake mix with some powdered freeze-dried strawberries and filled them with strawberry pie filling! Check out their construction in my Instagram video below! Isn't that neat? After the "jelly" part of the cupcakes are done we have to add the peanut butter! I'm a huge proponent of peanut butter and would put it on everything if I could. Whip it up with some powdered sugar, butter and milk and you have one killer frosting. In the video below I used a large open star tip to pipe the frosting onto the cupcakes. Did you catch the surprise at the end? I rimmed the frosted cupcakes in crushed up potato chips! No, it's not weird, it's actually really delicious! Peanut butter, jelly and potato chips. 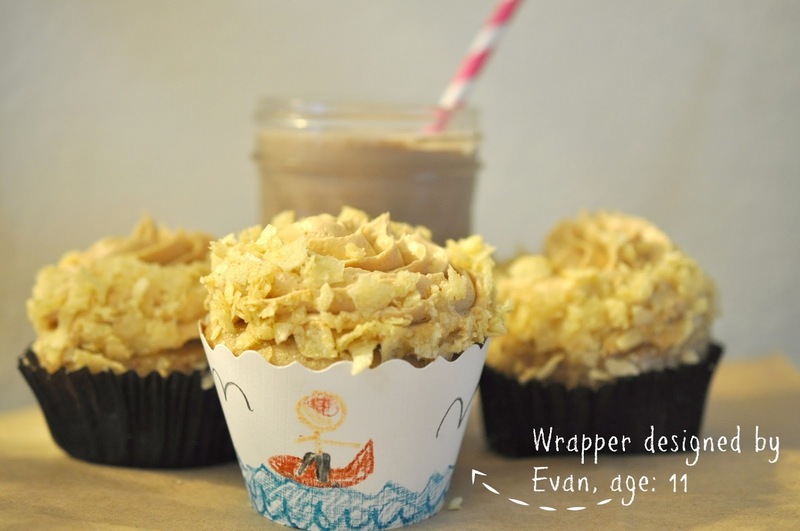 How is this not your childhood in a cupcake? Sweet, salty and sticky this cupcake is served best with some milk. Chocolate or straight up, your choice. What's been your favorite moment from this summer? What are you most looking forward to when you go back to school? Evan: Meeting my teacher! Zach: Seeing my friends! Prepare cupcakes as directed on box mix. Add powdered freeze dried strawberries and mix until combined. Bake at 325 degrees F for 15-18 minutes. Once cupcakes are done baking flip them out of the pan and let them cool completely on cooling rack. When your cupcakes are completed cool use a cupcake corer or knife to make a cavity in the cupcake. Set carved top aside. Fill cupcake with 1-2 tsp. of strawberry pie filling and replace cupcake top. In a stand mixer, cream together peanut butter and butter until combined. Gradually add powdered sugar until mixture is thick. Add milk one tablespoon at a time until desired consistency is achieved. Let whip for about 2-3 minutes to incorporate air into the frosting to get that whipped texture. You probably know what to do next! Just like all the other Cupcake Couture Blog Parties this is the part where you can enter to win a prize pack! 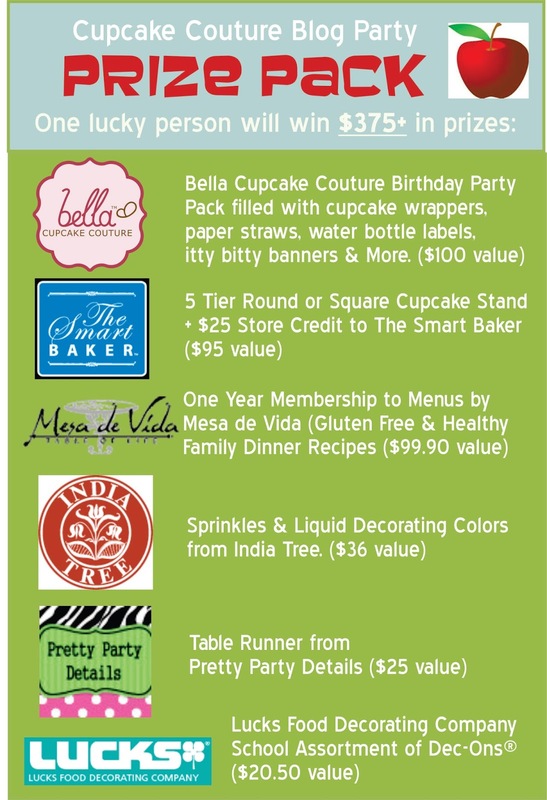 This time, one lucky reader will win over $375 worth of prizes sure to sweeten the baker in your life's day! Enter below for a chance to win! I love the comment, its like childhood in a cupcake! I hope your kiddos have a great year. I LOVE the potato chips on top. These sound like fabulous cupcakes! Great flavor!! Chips on top? Wow!! Love your brothers design too. Fun party! YUM! Great idea! Love the peanut butter topping! Such a tasty sounding cupcake. When I was growing up I actually didn't like peanut butter and jelly sandwiches at all. The funny thing is now peanut butter and jelly cupcakes are my absolute favorite. I was very excited when I saw your link was that flavor. Quite a little artist you have there as well. A very cute cupcake wrapper. Thanks for participating again! Combining all of my favorite things in a cupcake is awesomeness! Lovin' the wrapper! these are definitely childhood in a cupcake. IThe potato chip crust is killer. Love! The topping makes soooo epic! Love these cupcakes! 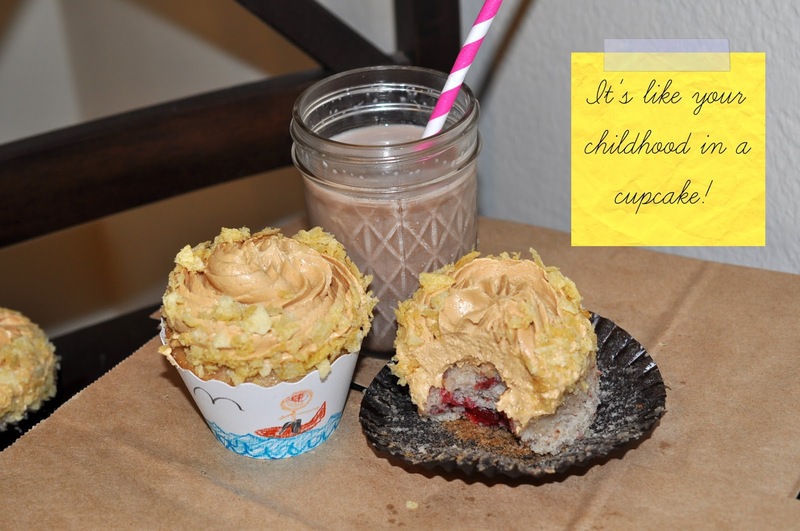 Nothing better than pb&j,except in a cupcake! Can't wait to try it out!